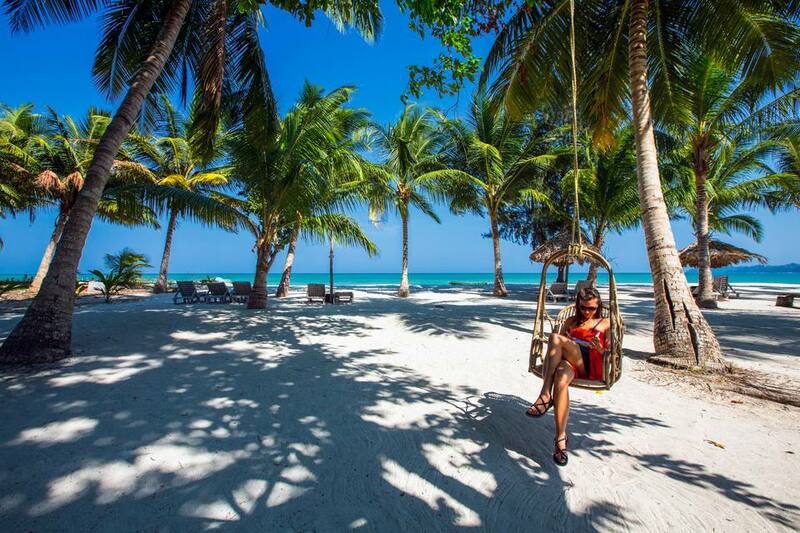 Havelock Island, in India's Andaman and Nicobar Islands, is renowned for its pristine beaches. Each beach at Havelock Island is commonly referred to by a number and you'll find most Havelock Island hotels grouped along the stretch of road from the jetty, from beach three to beach five. Beach five (also known as Vijaynagar Beach), on the eastern side of the island, is the the most developed and is where most of the action happens. Over the other side, to the west, pristine beach seven (also known as Radhanagar Beach) was once voted the "Best Beach in Asia" by TIME magazine. Beach five has brilliant sunrises, while beach seven has spectacular sunsets. You'll find that rates vary widely, depending on the time of year. Peak season is from mid December to mid January, and you can expect to pay 30-40% extra during this period. The best weather (and diving conditions) occurs from mid January to mid May. Discounts maybe offered during the monsoon season, from June to September. One of the oldest and most popular resorts on the most popular beach (beach number five), Silver Sand is also among the most expensive options for staying on Havelock Island. In terms of appeal, it's perfect for honeymooners or holidaymakers wanting a peaceful stay, as it has its own private bit of beach. Guest accommodations consist of 39 luxury air-conditioned wooden cottages. It's worth nothing that the resort is divided into two parts by a road. If proximity to the beach is a concern, do book one of the newly-built Andaman Lagoon rooms, as they're positioned on the beach side of the resort. Modern sea view rooms and suites are also available in the same area for those who want to splurge. The rather dated (and cheaper) garden-facing Andaman Cottage and Villa rooms are all across the road, on the other side of the resort. Facilities include a swimming pool and restaurant. Unlike many hotels on Havelock Island, beach chairs and umbrellas are provided too. Rates: From around 10,000 rupees per night plus tax for a double garden-facing Andaman Villa. Breakfast is included. Packages, including special honeymoon deals, are offered. Munjoh Ocean Resort was renovated in 2016-17 and undoubtedly has the most stunning cottages on Havelock Island. They're set under a crop of coconut trees a couple of minutes walk back from a private beach, near beach number five. Some of the cottages have two bedrooms, making them ideal for families and friends. The property is beautifully landscaped, and the staff are helpful and efficient. If you're in the mood for romance, request a candlelit dinner under the stars. Bicycles and scooters are available for those who want to ride around the island, and there's also a dive center inside the resort. Unfortunately, there's no swimming pool though. Rates: From around 11,500 rupees per night, plus tax. Breakfast is included. A reliable favorite, Barefoot Resort is one of the few hotels located at secluded beach number seven. It's not actually on the beach, but rather around five minutes walk away through the jungle. The first eco-friendly resort in the Andaman Islands, it's a place where you can truly get away from it all. There's no TV, Internet, or phone network. Do prepare to be isolated! The resort has 31 thatched wood cottages, tents, and villas distributed over its lush seven acres of grounds. Rates: From 10,500 rupees per night for an air-conditioned tented cottage and 13,500 rupees for an air-conditioned Nicobari Cottage. Tax is extra. Seashell is a rustic village-like beach resort, with 30 timber duplex villas and cottages surrounded by coconut trees. Located in the vicinity of beach number three (Govindnagar Beach) near the jetty, it has a tiny patch of sand peppered with hammocks and patio seating. If staying at a hotel with a bar is important to you, look no further than Seashell. The property has an atmospheric sea-facing bar with live music nightly, which you won't find elsewhere on the island. There's also a separate swimming pool and play zone for kids, two restaurants, and an in-house dive center. Rates: From 9,500 rupees per night, plus tax. Breakfast is included. Although you'd hardly know it from the careful way it's been maintained, Dolphin Resort is a government enterprise! Situated on the seafront near beach five, all lodgings are in newly constructed single story and two story cottage only meters from the beach. And, the beach is an attractive private one. What more could you want? There's also a restaurant (simple buffet lunch and dinner is served), bar, and conference hall on the premises. The only drawback is that there's no room service. Rates: Expect to pay 4,400 rupees per night, including breakfast, for one of the new cottages. Cheaper rooms are available for 3,000 rupees and 2,000 rupees per night, plus taxes. Emerald Gecko successfully blends backpacker accommodations with fabulous (and reasonably priced) food. It's frequented mostly by foreigners. Unlike many other hotels, it has a prime location right on the beach -- at the far end beach number five, on the most bustling stretch in Havelock, jam-packed with resorts, bars, restaurants, shops and the bohemian traveler-set. If you'd prefer to stay in a gorgeous cottage in the jungle, near Kalapathar Beach in the corner of the island, check out the Flying Elephant by the same owners. Yoga and meditation classes, and guided jungle walks, are offered. Rates: Choose from a selection of bamboo beach huts (1,648 rupees plus tax), bamboo bungalows (2,638 rupees plus tax), and bamboo lodges (3,188 rupees plus tax). If you're serious about scuba diving or want to learn, Island Vinnie's is the place for you! It's a full-service dive resort, with the most experienced dive team in the Andamans, situated at beach number three (the only suitable beach for diving). The resort itself is nothing flashy. Instead, value for money, a wide range of activities and a great social vibe are the main attractions. This is not a hotel where you'd want to chill on a hammock all day! Three types of accommodations are provided -- standard and upgraded huts, and tented cabanas. They were all rebuilt and upgraded in 2017, including a new toilet block. Note: due to increased demand, from December to April room bookings are only taken from people who are intending to dive. Rates: If you're on a budget, the very basic standard huts are cheaply priced at 600 rupees a night with shared bathroom. Including all meals, they're 3,400 rupees a night for a double. The upgraded huts are 1,800 rupees per night. The tented cabanas have attached bathrooms and are priced at 3,500 rupees a night, going up to 6,300 rupees a night for a double with all meals included.